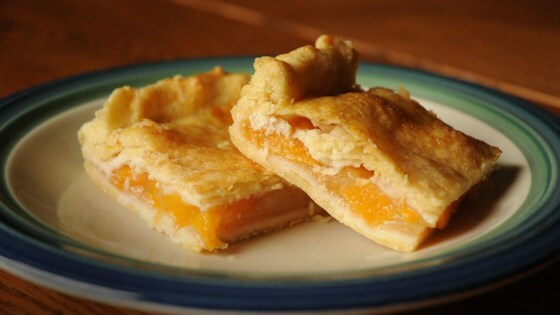 "Peach pie in pick-up-able form! My grandmother has made this recipe for over 50 years and it has always been a favorite of mine. My kids LOVE this recipe! This pie is best in my opinion, when it is completely cooled." Mix together the flour, 2 tablespoons of sugar, and a pinch of salt in a large bowl. Cut the shortening into the flour mixture until the mixture resembles coarse crumbs. Beat the egg in a small bowl, and pour it into a 1-cup measuring cup. Pour in enough cold water to total 1 cup, and mix the water and egg into the dough. Mix the dough a few times with your fingers, until it holds together. Divide the dough in half. Whisk together 3/4 cup of water with the cornstarch in a bowl until smooth, and set aside. Mix 1/2 cup of water with 3/4 cup of sugar in a large saucepan until the sugar has dissolved, and bring to a boil. Whisk the cornstarch mixture into the boiling sugar mixture until thickened and translucent, whisking constantly, about 1 minute; whisk in 1/4 teaspoon of salt and lemon juice, if desired. Combine with the sliced peaches. Roll half the crust out on a floured surface in a rectangle shape about 12 by 20 inches, and fit the pastry into a 10x15-inch jelly roll pan. Roll the second half of the crust out to the same size as the first crust. Pour the peach filling into the bottom crust, and place the top crust on the pie. Crimp and fold the edges to seal, and cut several slits into the top crust. this was delicious! i love peaches and am always on the look out for new and wonderful peach recipes. We love this too at our home! Thanks for posting Jamie! We like it cold too! You can make this with canned peaches too if fresh aren't available. Very good, and a great take-along for a cookout. Crust came out delicious. In my opinion, the filling needed some spices, but all-in-all a nice, simple way to use peaches!